What’s the difference between a smart lighting manufacturer, a beverages company and an apparel brand? Although that sounds like a bad – albeit very obscure – joke, the answer is actually ‘less than you might think’. On the surface, they have different offerings; and in the context of IoT, their use cases for digitally enabling their products are distinct. What they have in common is that none of their physical products exist in isolation. They have real-world relationships and connections to other physical objects. They have components and ingredients. They may form part of cases, batches or shipments. They can be sent to a range of distributors, partners and retailers all over the world. And in the case of smart devices, they’re located near other connected products, in different rooms, buildings and campuses. If you’re managing these smart products, you need to capture all these diverse relationships. How do you represent them logically within a data model and in a UI? It’s no straightforward task, especially when dealing with massive product volumes. We’re delighted to share that we’ve just deployed a new feature in our Smart Products Platform that tackles this very issue, which we’ve called “Collections”. It’s an intuitive, visual way for our customers to create and manage collections of smart products via the EVRYTHNG dashboard. The EVRYTHNG platform has always had a flexible semantic data model, which enables the capture of dynamic properties and behaviours of all products, whether they’re connected electronic devices, or unconnected consumer products with unique identifiers such as bar codes, QR codes or smart NFC-enabled packaging. Collections builds on this model, enabling you to create bespoke groupings of products based on any number of hierarchical relationships. For example, for supply chain and product tracking you might want to record the complete end-to-end hierarchy: all the constituent parts (cap, bottle, label, ingredients) of every manufactured item, and then map these to the case, batch and shipment that bottle was part of. According to industry research, 50% of recalls result in losses of over $10m and take an average of 34 days to enact, so being able to report and track affected items in real time in a very granular, targeted way will save time and money if the worst happens. Using Collections enables you to quickly and efficiently identify and locate specific batches, cases or items that are at fault. Creating logical groups or relationships is equally valuable for connected devices too – for reporting as well as actuation. For example, by grouping lights virtually into rooms, floors or even zones, you can take collective action through custom rules. 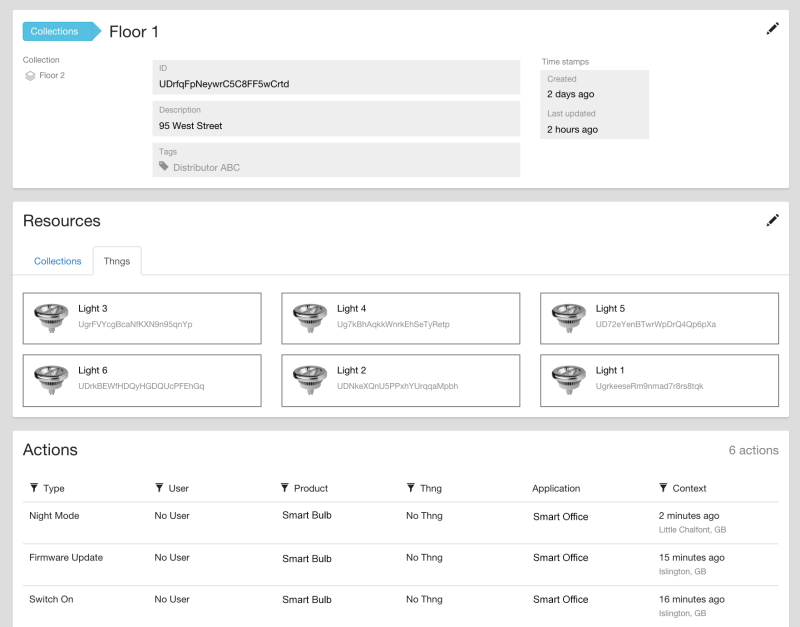 Automatically update the firmware for all products connected to a particular gateway, dim all devices on the ground floor, or track energy consumption for lights in a certain retail aisle – the scenarios are endless. At EVRYTHNG we focus a lot of R&D effort on improving functionality and usability, working closely with our customers as their deployments grow and their requirements evolve. We look forward to sharing more details of continued enhancement of our Smart Products Platform, providing our customers with even more flexibility in the way they manage their IoT applications.